Why Should You Buy from Warner Plastics? Quality: We buy directly from the factories so we control what ingredients are added to our plastic. We refuse to compromise on the quality of our plastic. We ask ourselves: "What kind of plastic would we want in our own dump trucks?" and then sell this type of plastic to our customers. Price: Since we buy plastic in large quantities and operate with low overhead, we can sell our products at an extremely affordable price. Service: We are knowledgeable about our products and a wide variety of applications. We stand behind our products 100% and if for some reason you have a problem, we will make it right! We can usually ship the same day as ordered. Inventory: Because one of our mottos is "If you don't stock it, you can't sell it," which is why we stock over 400,000 pounds of HMW and UHMW at any one given time. We stock over 40 different roll sizes and thicknesses and over 35 different sheet sizes and thicknesses. Experience: We have used our own products in our dump trucks for almost 20 years! This gives us a unique perspective that our competition just doesn't have. No matter what your situation, we can say: "Been there, hauled that!" We install liners in our own shop and we can support you on all your installations. "A customer for life": Many companies are focused on the short-term, one-time sale, but we at Warner Plastics are focused on the long-term. We want "customers for life" and the only way to achive this it to offer a Quality product, at a great Price with unmatched Service. Copyright © 2004-2019. 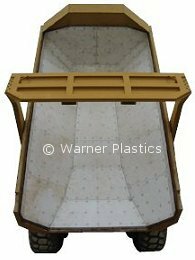 Warner Plastics and Liners. All rights reserved.